Last month, on Easter Saturday I participated in the QRP HOURS Contest for 2015. This year, the contest got a bit of a boost with promotion among the many portable activators including SOTA, VKFF and SANCPA Yahoo Groups. The concept is simple, it is 2 hours long, split into 2×1 hour categories. The first hour is CW and Digital including PSK31 and RTTY, the 2nd hour is Phone (SSB) and is on 80M. Rules are simple, QRP stations (5W CW/Digital or 10W SSB) get 1 point for every station worked and no repeats. 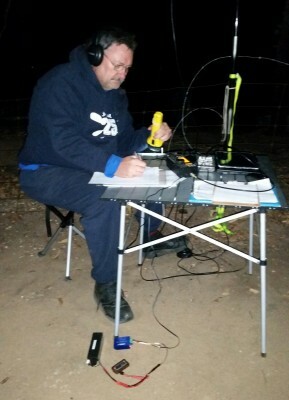 Given the very nature and the fact that the noise floor at home is only s9 when it is quiet, I headed up to my favorite SOTA summit, Mt Gawler, VK5/SE-013 for the contest. I decided on this for 2 reasons – the obvious being that the noise floor should be a bit lower than home, and the fact that nobody had done an 80M activation of this summit. Arriving only 15 minutes before the start (nothing like being prepared) it was a bit of a mad scramble to get everything set up, got the table out, set up the laptop with the KX3, then rolled out the 80M dipole and hung it up a 9M squid pole at around 8M. I should have planned better and borrowed a 12m pole to get the antenna a bit higher, but hey you do what you can. Saturday night was pretty chilly up on the hill and it was down around 10deg and a decent wind made it feel more like zero! Only 2 minutes late starting, I finally got on air running PSK with only 3W to find a reasonable number of signals. Now, I was going ultra-low-tech here and was only using the KX3 Utility program and relying on the built-in features of the KX3 to decode signals. Yes, no waterfall display, just tuning the approx 3khz and trying to land someone calling cq. The difficulty here was that I had never actually had a PSK31 contact using the KX3 beforehand so other than reading the manual and watching a few YouTube video’s on how to set it up earlier in the day I was totally unprepared for the first hour. As a result, I probably did miss out on at least 5 or 6 more contacts that went begging during this hour. It was pretty tough operating like this, and there were quite a few incompletes that I did not log. Yes, there was a bit of noise about on 80M, but still nowhere near as bad as at the home QTH. It was only moderately successful as far as the contest was concerned but did manage to complete 4 contacts, VK1, VK3, VK5 and VK6. from a SOTA perspective, this was great, I qualified the summit on 80M DATA – 2 firsts for this often activated summit. At the start of the 2nd hour, I unplugged the computer, cranked the power up to a massive 5W and went about doing the “hunt and peck” and worked the 5 or 6 stations whom I could hear across the voice segment. As soon as I had worked as many as I could, I found a clear frequency and started calling CQ. It was a case of calling and waiting for them to come to me. There were bursts of activity and long periods of no replies and the unfortunate fact that with storms between VK5 to the East it made some contacts quite difficult! There were probably a lot that I missed out on no doubt. At the end of the night I had 23 contacts in my log, only to find that on checking later there was 1 dupe, so it will not count towards my score, with contacts to VK1, VK2, VK3 and VK5. I already know that there were several other stations who managed bigger scores than myself – as 1 serial number I was exchanged was 39 – and that was about the 42 minute mark!